Economists say India doesn’t need to worry as it only meets one of the three criteria. What is currency manipulation and who determines it? The US Department of the Treasury publishes a semi-annual report in which the developments in global economic and exchange rate policies are reviewed. If a US trade partner meets three assessment criteria, the US labels it a currency manipulator. The US then tries to solve it via bilateral talks. The October report of the Treasury says that it continues to press major trading partners that have maintained large, persistent external surpluses to support stronger and more balanced global growth by facilitating domestic demand growth as the primary engine for economic expansion. 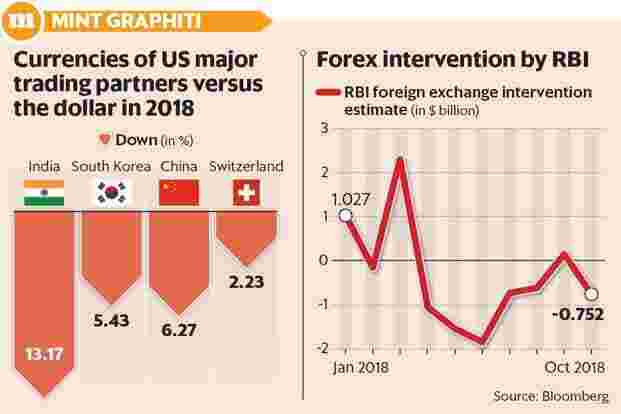 How are currencies on the watch list faring in 2018? Economists say India doesn’t need to worry as it only meets one of the three criteria. “If this remains the case at the time of its next report, Treasury would remove India from the Monitoring List," the report said. Ananth Narayan, associate professor (finance) at SP Jain Institute of Management and Research, said India being on the watch list was not important. “If we were to be labelled as manipulators, there would have been pressure on India to reduce tariffs," he said. “... that is going away now."